A spacious first floor, light and airy open plan bedroom suite with brand new decor and furnishings throughout. 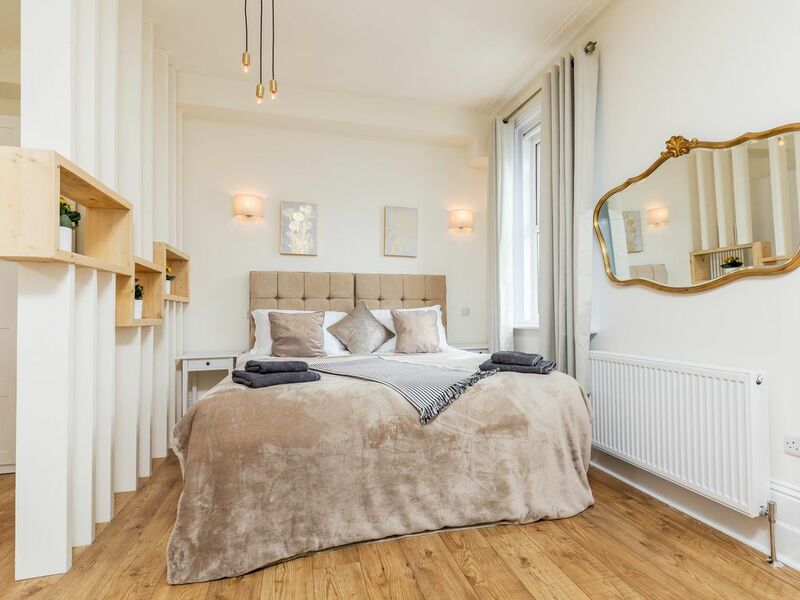 Impressive, modern, bespoke designed partition walls, window seat and breakfast bar with 4 stools.The suite has it is own separate shower room with a modern chrome shower , wash basin and toilet. There is also a brand new open plan kitchenette (with oven, hob, fridge, microwave, kettle and toaster). This suite is suitable for couples or a couple with 2 young children and a small group of friends (maximum 3). The suite is fully fitted with high speed WiFi, 40 inch flat screen smart TV’s (including Netflix and BBC and ITV iplayer). All of the furnishings and decor are brand new and the Sellers suite has a modern and luxurious classic feel. Please note that whilst this suite is fully refurbished there are still some refurbishing work undergoing in the property. This should not impact our guests stay however there could be potential for noise between 9am-5 pm on work days. Until this work is finished we have reduced our pricing for the suite to reflect any possible inconvenience. This work should be finished by the end of February. Bike hire, there are 2 bikes available to hire for £15 per day. This is a newly refurbished guest house and it has been done to a very high standard. With it being fairly new and a work-in-progress, there were a couple of teething problems, but they were addressed really quickly and Bell was very friendly and helpful. Slight traffic noise at the front, but this might not bother those who aren’t light sleepers - ear plugs did the trick! It’s a fairly old and characterful property, with creaky floors which can’t be helped but movement can be heard a lot in the lower floors. I mentioned this and Bell arranged for a rug to be put down on the upstairs wooden floors which helped a lot - again, great customer service! I would highly recommend this property, and once all the renovations are complete it should quiten down (but this was reflected in the price and really was just noise due to more people coming and going rather than building work). Es handelt sich hier um ein sehr schönes Appartement, geschmackvoll und modern eingerichtet. Wir haben uns sehr wohl gefühlt. Die Besitzerin ist sehr sympathisch und bemüht um ihre Gäste. Wir würden in jedem Fall wiederkommen. Please note that whilst this suite is fully refurbished there are still some refurbishing work undergoing in the property .This should not impact our guests stay however there could be potential for noise between 9am-5 pm on work days (wood cutting and sanding). Until this work is finished we have reduced our pricing for the suite to reflect any possible inconvenience. This work should be finished by mid-February.